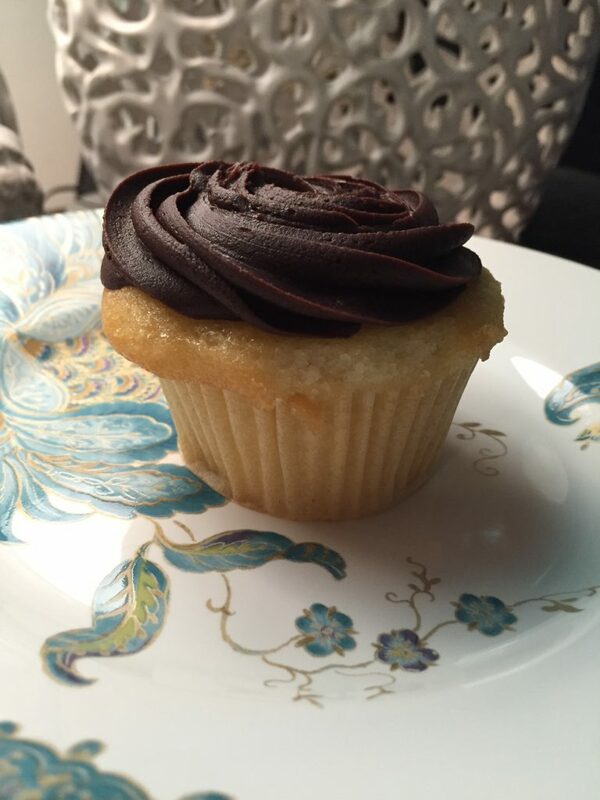 Cupcakes in the City is back with installment number three! This time around I checked out the well known NYC staple, Magnolia Bakery. My first time visiting Magnolia’s was back in college when I was interning for The Rachael Ray Show. My commute brought me through Grand Central Station. While exploring the station during my semester interning, I found in the food court a quaint bakery stand, and lo and behold it was Magnolia’s. I was mesmerized by the brightly colored frosted treats. Fast forward to today, Magnolia’s has become a favorite so I knew I had to include them in this series. 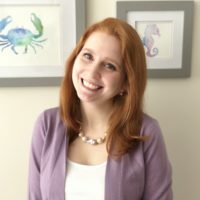 The Magnolia Bakery I visited for this post was located in Penn Station. 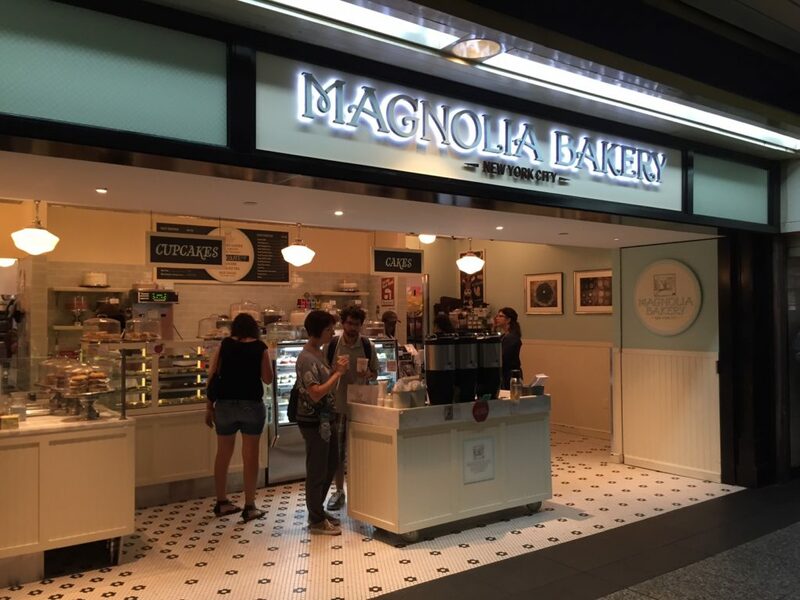 You can’t imagine my excitement when I saw Magnolia’s was moving into Penn Station, making it oh so convenient for me to grab a treat on my way home to New Jersey after my commute from work. The shop in the station is fairly small and it can get very crowded during rush hour, but the line moves fast and before you know it you have a bag of goodness. 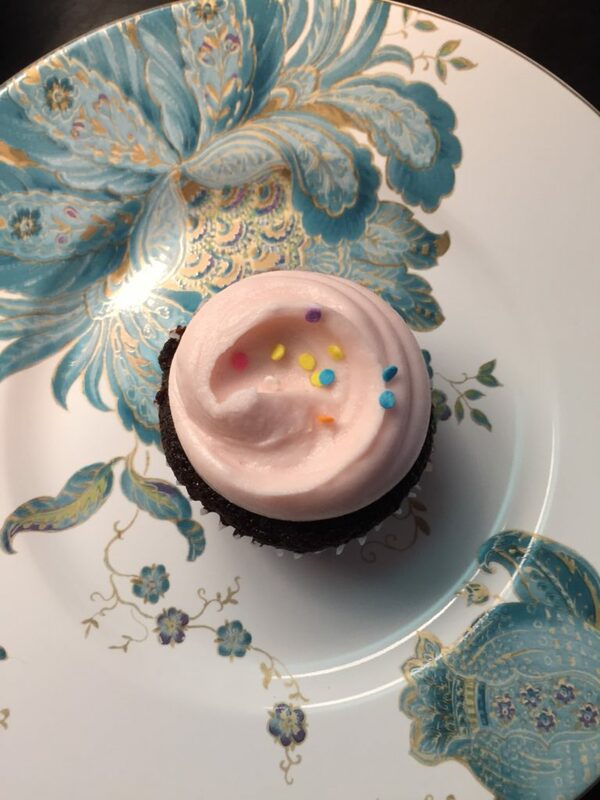 Appearance: Traditionally the cupcakes from Magnolia Bakery are known for their pastel frosting and a dash of sprinkles. 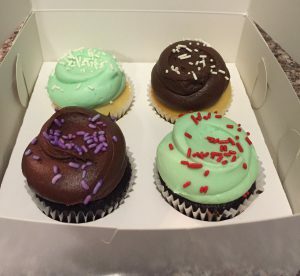 You can probably request your prefered frosting colors, but I typically just say give me 2 chocolate cupcakes with vanilla frosting and I get what I get. 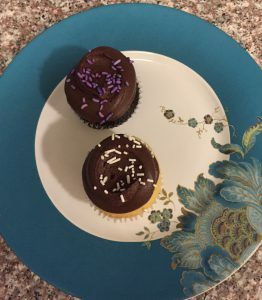 I’ve always found these cupcakes to be some of the prettiest, even though they really aren’t that fancy, but the pastels and sprinkles do it for me. Frosting: Creamy, decadent, melt in your mouth goodness. I find the chocolate frosting in particular is very milk chocolatey. If you get the vanilla frosting, I find it can sometimes be too sweet, leaving a bit of an aftertaste. I’m a huge frosting gal, so when I find frosting to be too sweet, you might want to watch out! 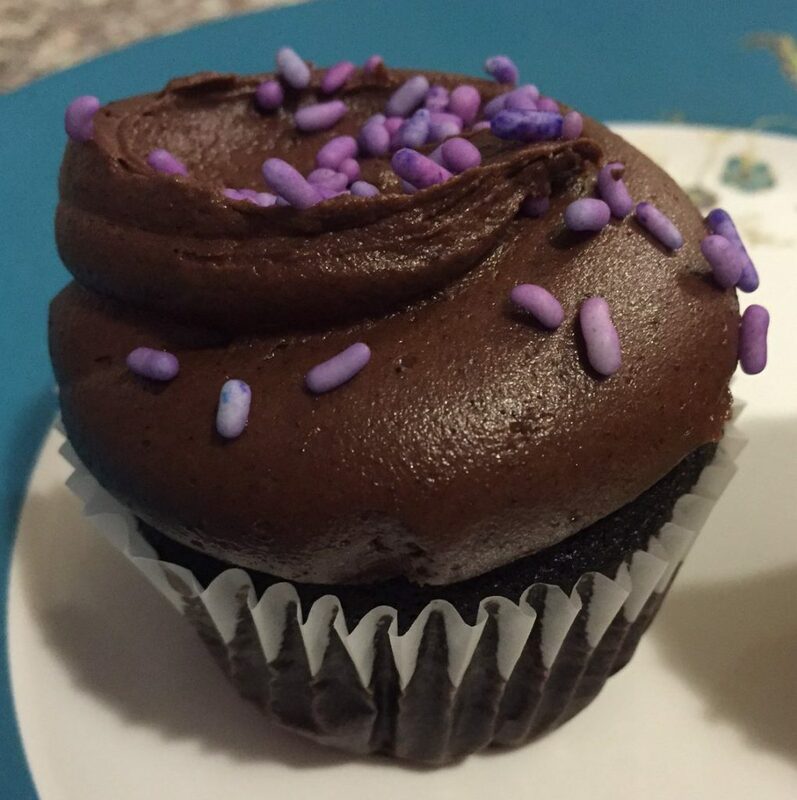 Cake flavor/consistency: The chocolate cake itself isn’t full of overwhelming chocolate flavor, but paired with chocolate frosting, it’s just perfect. The consistency is just right, with the perfect amount of freshness. A solidly constructed cupcake! 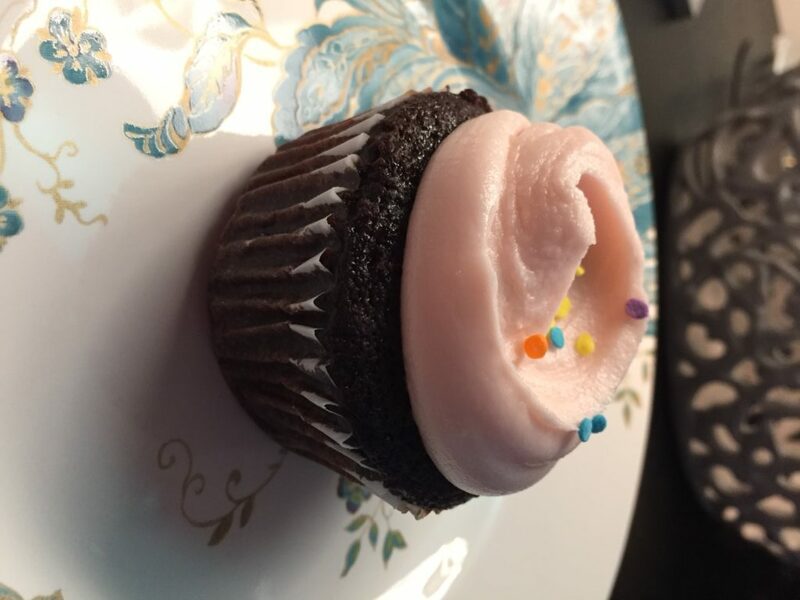 My boyfriend tried the vanilla cupcake and found it to be a bit dry, but we’ve since had Magnolia again and it seemed to be just that particular day that we had a miss. 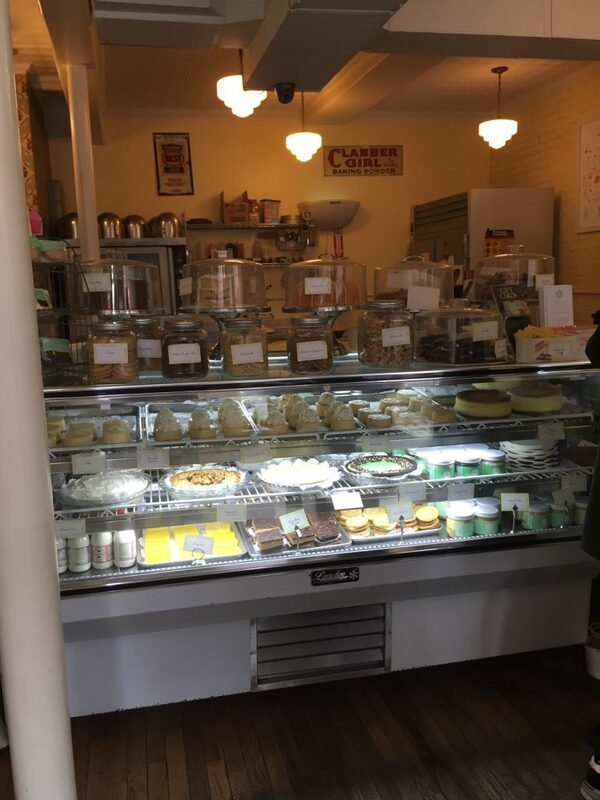 Magnolia Bakery also offers a ton of other sweet treats from very popular puddings, slices of cake that tempt you from their displays, cookies, and more! 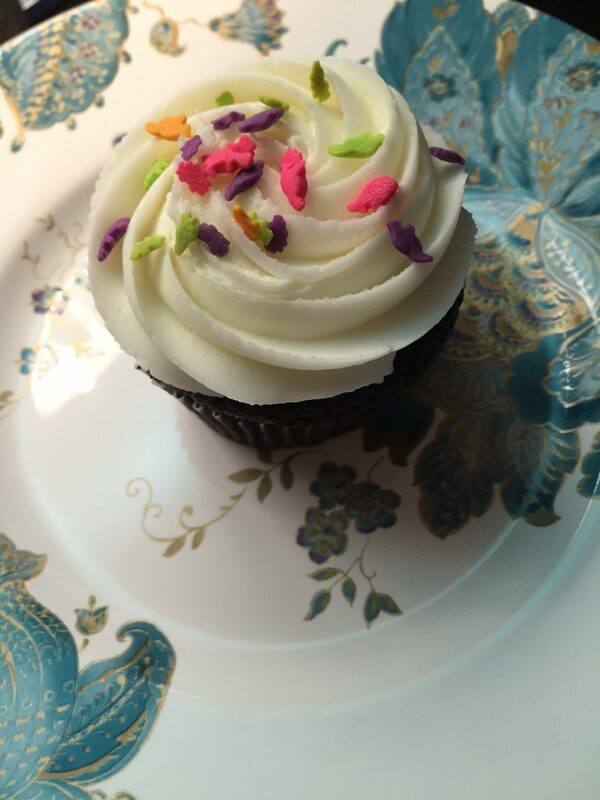 However, you can’t go wrong with a Magnolia cupcake in their beautiful pastel goodness! 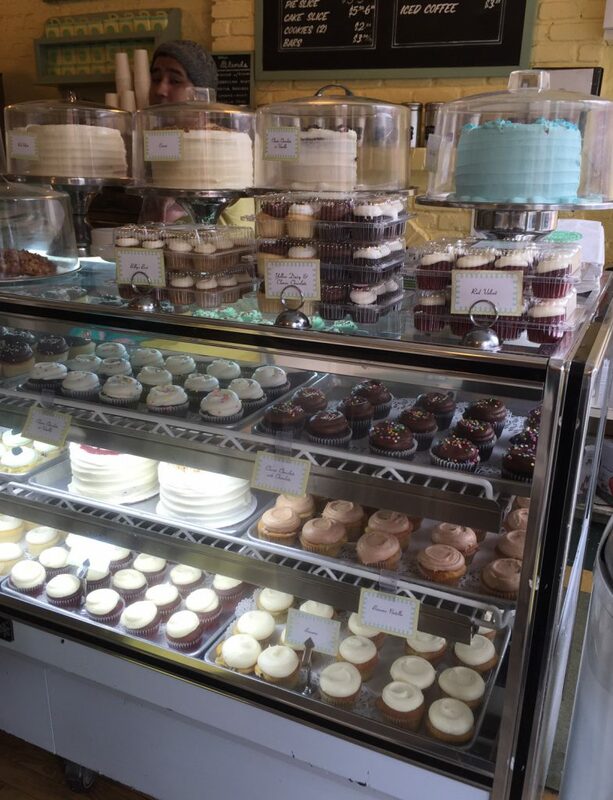 If you’re interested in trying one of New York’s best chain bakeries for cupcakes, then you have to stop by. I recommend visiting the shops in Penn Station and Grand Central if you’re travelling so you can get in and out and take your treats home instead of carrying them around the city all day. Coming up next time in Cupcakes in the City will be Empire Cakes. Now go get yourself a sweet treat! Cupcakes in the City, round two! 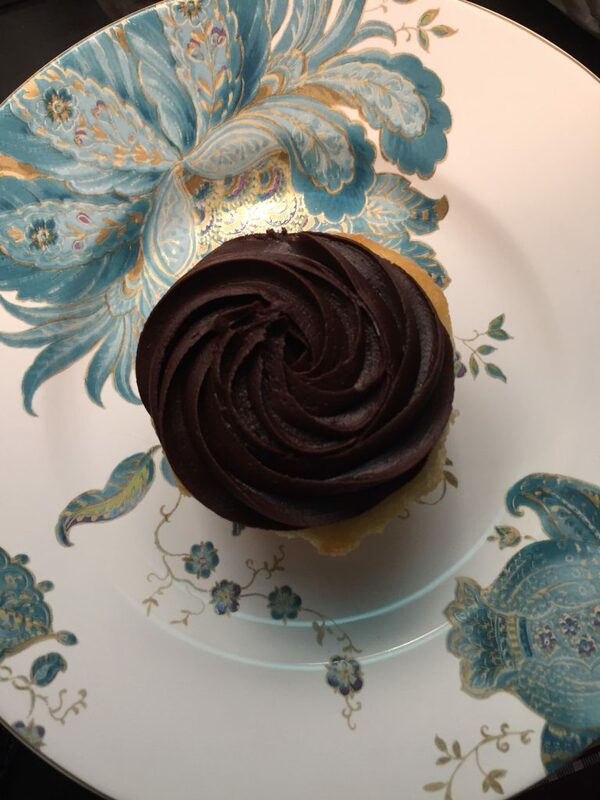 For those of you just joining this cupcake adventure, I’ll be focusing on the old fashion chocolate and vanilla cupcakes. 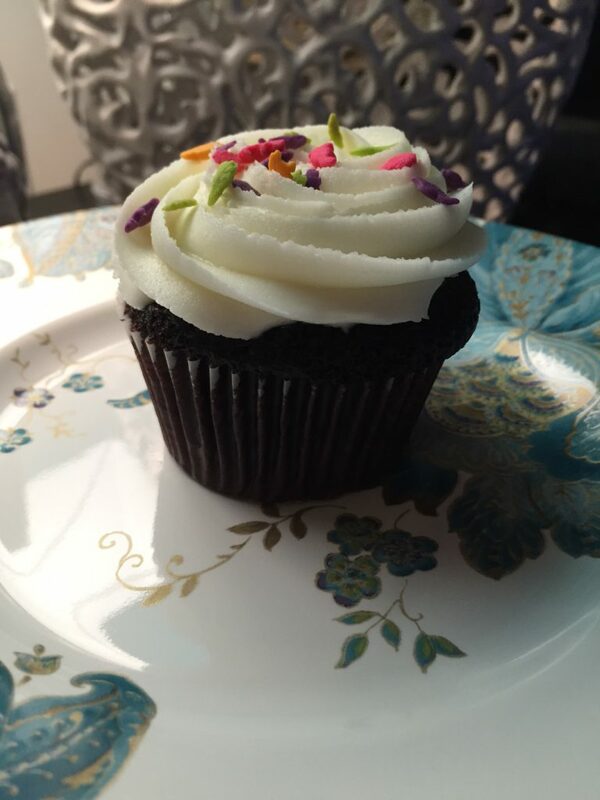 Read about our first Cupcakes in the City stop here. 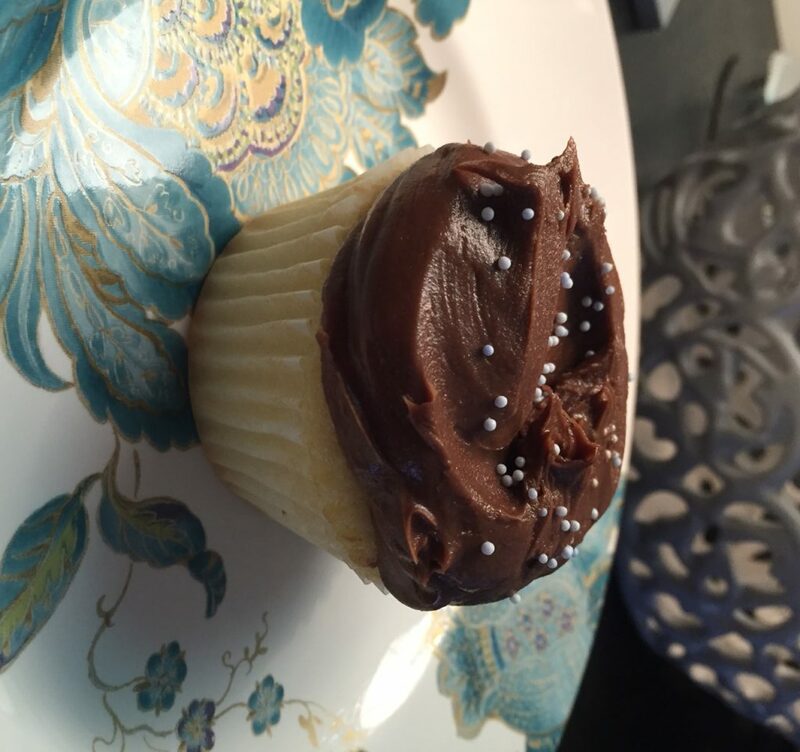 This time we headed over to Molly’s Cupcakes. 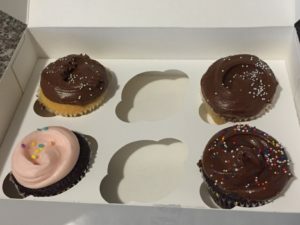 I’d read a bunch of articles about cupcakes around the city, and Molly’s came up a few times. People kept raving about the cupcakes, saying they were better than most places in the city so I had to put Molly’s to the test. 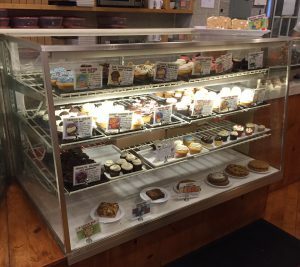 Hearing that Molly’s had a service called “create-a-cupcake” where you tell them cake flavor you want, what type of frosting, and you can top it off with an assortment of toppings, I knew I had to visit sooner than later. The bakery was, in my opinion, a hipster joint. 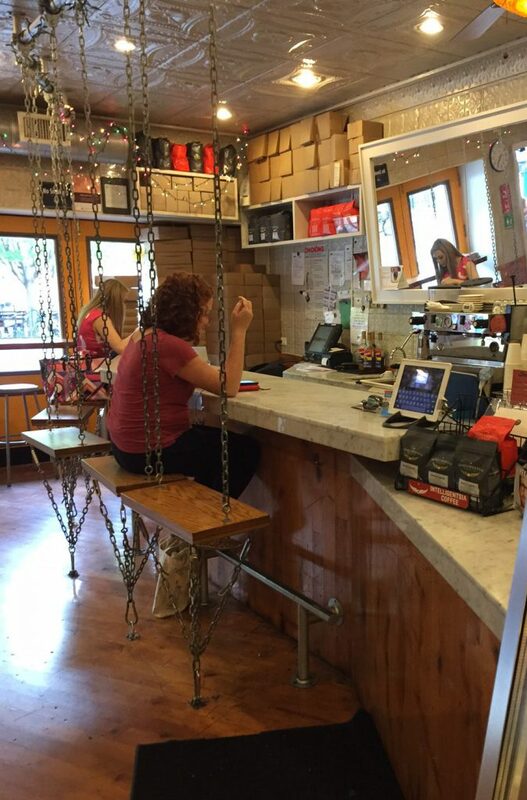 From the workers, customers, to the decor, everything just screamed hipster. Now I’m not saying that’s a bad thing, but it’s definitely a different vibe than the other bakeries I’ve been to in the city. Appearance: Plain and simple with no frills. The cake itself glistened with moisture. Molly’s “Build Your Own Cupcake” isn’t a pretty cake, but some of their cupcakes and desserts on display did have more attention to detail and were cuter looking. Frosting: Sweet and thick, with a strong flavor. There’s no subtlety here. 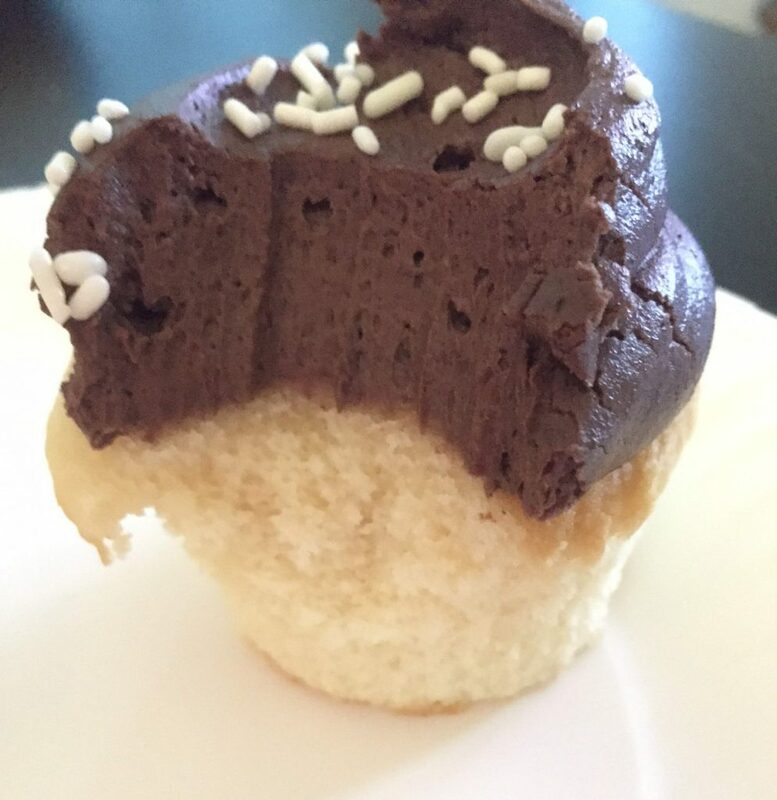 I tried a cupcake with vanilla frosting, and one with chocolate. 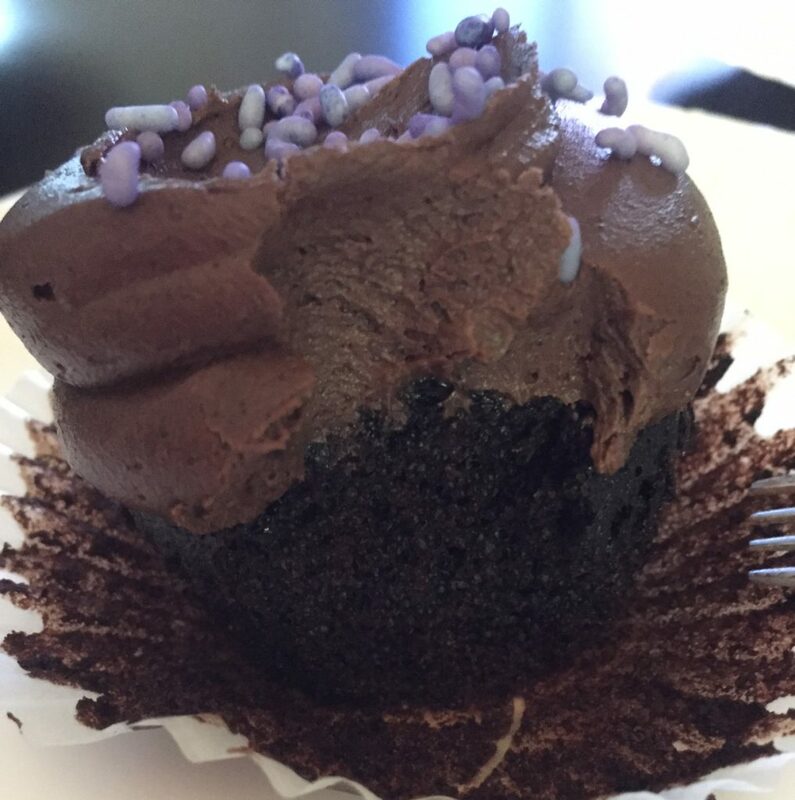 I highly recommend the chocolate frosting! Cake flavor/consistency: Very moist, which can be seen in a positive and negative light. The cake was so moist that when you took a bite with frosting, you could almost not tell the two apart since they both were of the same mushy consistency. 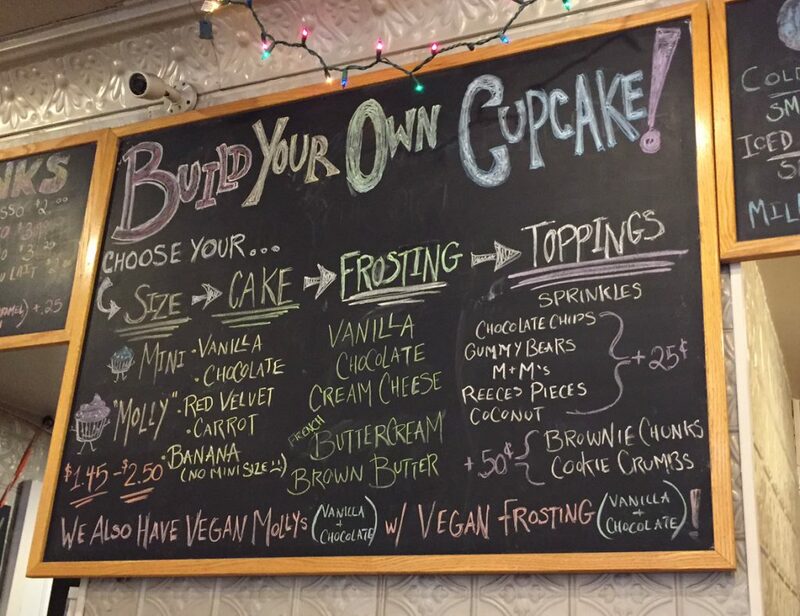 The cupcakes you can build yourself were kept in Tupperware containers behind the counter. Being kept in such an environment, perhaps without cooling properly left the cakes very wet to the touch, leaving behind moisture stains in the cardboard boxes they came in, something I haven’t experienced previously at other popular bakeries. Grabbing the cupcakes (in their wrappers) was slippery and not the best experience. I was hoping for the building experience to be special and fun. I had seen a review online that made them sound magical, saying you got to watch the staff create your cupcake right in front of your eyes. The worker I interacted with was far from magical, and seemed disinterested. 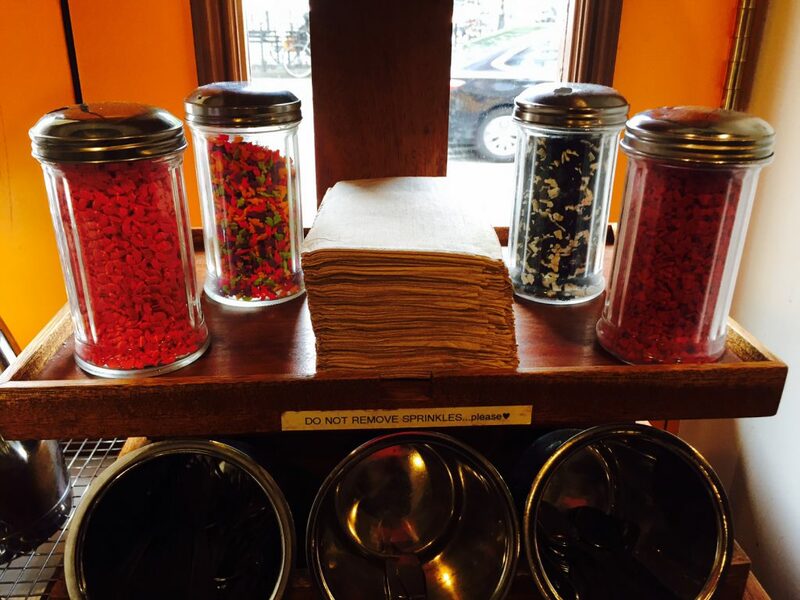 The featured sprinkle station was far from exciting. 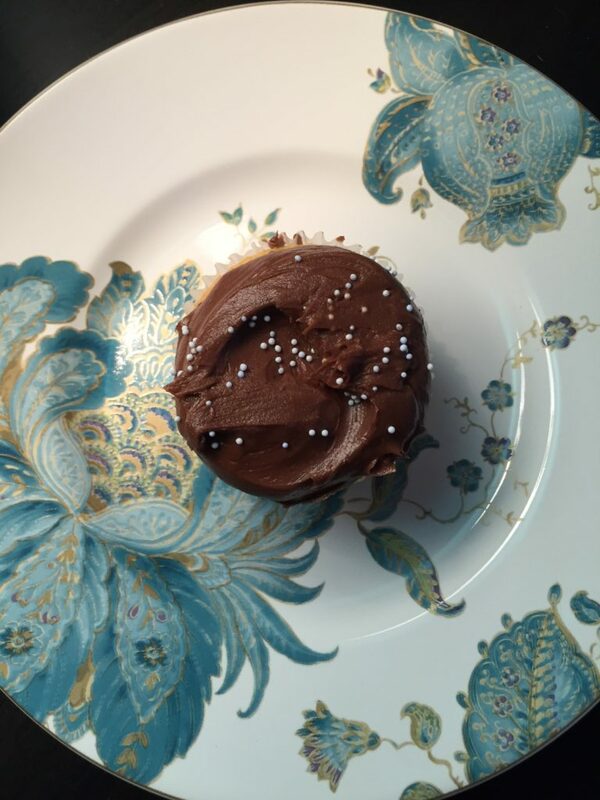 I was hoping for several cool types of sprinkles that I could spoon onto my cupcakes, instead, you got what you see below…not even traditional sprinkles in sight! In the end, the cupcakes tasted fine, but the frosting was a bit heavy for me, which is saying something since frosting is usually my favorite part of any cake. If you ever find yourself on Bleecker Street in NYC, poke your head in! 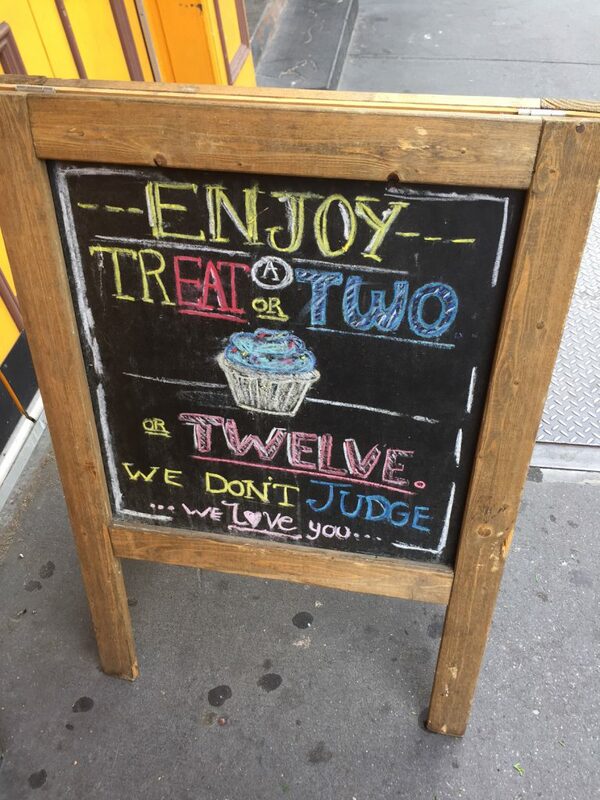 You’re sure to find something sweet to enjoy.